This week we’ll talk about some sad news from the makers of my beloved Clarify, then I’ll do a crazy deep dive into the National Institute of Standards and Technology about two-factor authentication. I do this to help you understand what your bank needs to know about using SMS or email or a phone call for authentication (spoiler, they shouldn’t). Then I’ll tell you about how much fun Sandy Foster and I had figuring out how to rip a (non-copy-protected) DVD in a modern version of macOS. In the last segment we’ll have fun with geometry as I try to figure out which screen is physically bigger, iPhone X or iPhone 8 Plus. 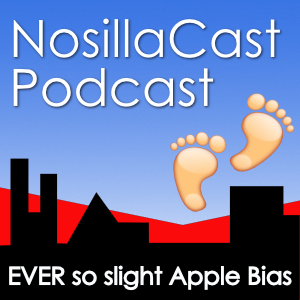 Hi this is Allison Sheridan of the NosillaCast Mac Podcast, hosted at Podfeet.com, a technology geek podcast with an EVER so slight Apple bias. Today is Sunday, September 24, 2017 and this is show number 646. Before we kick in, I want to make a correction from last week’s show. When I was talking about Face ID on iPhone X, I quoted an article by a blind gentleman who had written to Apple asking about how Face ID would work for the blind who either have their eyes always closed, or prosthetic eyes. I got his name wrong, but I figured out why. His name is Jonathan Mosen, but auto-correct keeps changing it to Moren on my Mac! His website was wrong in the shownotes for the same reason. His company is Mosen Consulting at mosen.org. Thanks very much to Dan for correcting me on this! Chit Chat Across the Pond was delightful this week. Megan Morrone from TWiT joins us again, this time to talk about her shiny new iPhone 8 Plus. She’s funny and kind and delightful. She also talks about how her identical twin sons, Milo and Huck, plan to become wildly famous YouTube stars when they test Face ID with Leo’s iPhone X when he gets it. Check it out either in the Chit Chat Across the Pond Lite feed, or the full Chit Chat feed. This week I’ve been working on something cool for the Amazon Affiliate Links on Podfeet.com. For you to be able to share the love to the podcast through Amazon, I have to open an account in your country’s version of Amazon. It’s not a trivial exercise at all to do that, which is why I’ve only done it for Germany, the UK and Canada. Anyway, even if I do this work, you still have to remember if I talk about a product that’s on Amazon to go over to podfeet.com/funwithflags to find the link for your country’s Amazon and then do a search for it. Lots of overhead for you. But Amazon came out with something cool just recently, and that’s a way to link the UK and Canada stores to a US store. In theory, if I get this working properly, you’ll be able to click on a link in a blog post and if you’re in the UK or Canada, it will automatically switch over to your Amazon Store. Note that I said “If I get this working”. The first step was easy, I had to link the stores together and then validate that they were connected. That took two seconds and it worked. But then there’s a script that I need in the footer of my WordPress theme, which means a plugin to talk to the footer. I found a plugin, and I put the Bartificer Clock script into it for the Live show page and it works, so I know the plugin is working. But…for some reason the Amazon script isn’t working according to my testers, Steven Goetz from Canada and Roger Nash from the UK. I tried to do this on my own but it looks like I’m going to have to bug Bart about it. Anyway, thanks for clicking the Amazon Affiliate Links that help fund the podcasts! Which Screen is Bigger, iPhone 8 Plus or X? AKA Fun with Geometry! That’s going to wind this up for this week. Don’t forget to send in your Dumb Questions, comments and suggestions by emailing me at allison@podfeet.com, follow me on twitter @podfeet. Remember, everything good starts with podfeet.com/. podfeet.com/patreon, podfeet.com/facebook, podfeet.com/googleplus, podfeet.com/amazon! And the newly created page, podfeet.com/wingman. And if you want to join in the fun of the live show, head on over to podfeet.com/live on Sunday nights at 5pm Pacific Time and join the friendly and enthusiastic NosillaCastaways. Thanks for listening, and stay subscribed. What about the curve underneath the screen? That’s at least a half inch more. The semi-circles at the bottom were removed in the calculations.